Brand:	Wilwood Product Line:	Wilwood Slave Cylinders Slave Cylinder Type: Pull Slave Cylinder Material: Billet aluminum Slave Cylinder Finish: Black powdercoated Slave Cylinder Inlet Size (in): 3/8-24 Slave Cylinder Maximum Length (in): 11.75 in. Slave Cylinder Rod End Hole Diameter (in): 0.380 in. Slave Cylinder Stroke Length (in): 1.375 in. Slave Cylinder Stud End Thread Size (in): 5/16-24 Quantity: Sold individually. Slave Cylinder, Aluminum, Black, Pull-Style, 11 3/4 in. Extended, 1 3/8 in. Stroke, Universal, Each * Check to make sure this part fits your application Great for racing or off-road. 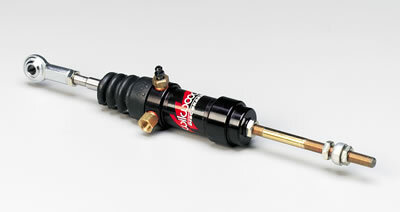 Ideal for drag racing, Circle Track, Pro Street, or off-road, these slave cylinders from Wilwood feature a longer-than-normal stroke to ensure full clutch release. Made from billet aluminum for high strength, and plated with a tough anti-corrosion finish, the cylinders are pull-types and have a stainless steel pushrod.